The event was complete with a birthday cake, balloons and a nod to the wonderful charitable works happening all across the globe. Additionally, the club bestowed a Paul Harris Fellowship to Member Helena Trent, making the Cranberry Township Noon Rotary Club a 100 percent Paul Harris Fellowship Club. Rotarians are bestowed a Paul Harris Fellowship when they have committed $1,000 of their personal funds to Rotary International. Dignitaries attending included Past Rotary District Gov. and Member Hank Anna, who served as emcee, Rotary District Gov. Tom Chelgren, Rotary District Gov. Elect Judy Hughes, Rotary Past District Gov. and Major Donor Patty Meehan, Rotary Assistant District Gov. Beth Marshall and Cranberry Township Manager and Cranberry Township Rotary Sunrise Member Jerry Andree. “It was a terrific time and a great opportunity for us to demonstrate our commitment to the Rotary Foundation, and to celebrate our success as a community service organization,” said Linda Andreassi, past president and member. The Foundation is the $1 billion charitable arm of Rotary International. To mark the centennial, Rotary aims to raise $300 million by July 2017 for its campaign to eradicate polio and for service in communities around the world. 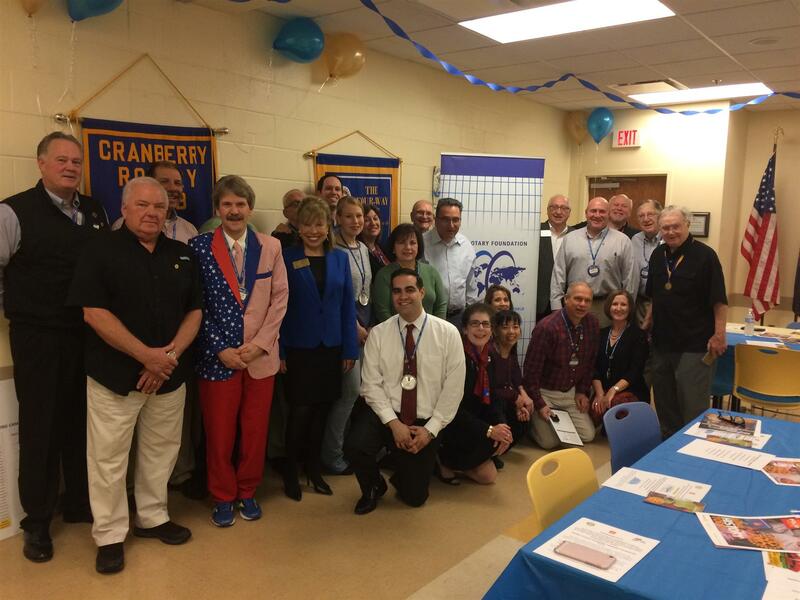 The Cranberry Township Noon Rotary Club has, in the 46-year history of the club, donated nearly $100,000 to the Rotary Foundation. Most of those donation have been made by individual members, not Club funds. Established in 1917 with a donation of $26.50, The Rotary Foundation is dedicated to advancing world understanding, goodwill, and peace. Through grants and other resources, Rotary members develop sustainable projects that promote peace, fight disease, provide clean water, support education, save mothers and children, and grow local economies. Rotary’s top priority is the global eradication of polio. Rotary launched its polio immunization program, PolioPlus, in 1985 and in 1988 became a leading partner in the Global Polio Eradication Initiative along with the World Health Organization (WHO), the United Nations Children’s Fund (UNICEF), the U.S. Centers for Disease Control and Prevention (CDC) and more recently, the Bill & Melinda Gates Foundation. Rotary has contributed more than $1.5 billion and countless volunteer hours to eradicate polio. Through 2018, every dollar Rotary commits to polio eradication will be matched 2-to-1 by the Bill & Melinda Gates Foundation, up to $35 million a year. Since the initiative began, the incidence of polio has plummeted by more than 99.9 percent, from about 350,000 cases a year to less than 71 confirmed in 2015. Rotary brings together a global network of volunteer leaders dedicated to tackling the world’s most pressing humanitarian challenges. Rotary connects 1.2 million members of more than 34,000 Rotary clubs in 200 countries and geographical areas. Their work improves lives at both the local and international levels, from helping families in need in their own communities to working toward a polio-free world. For more information, visit Rotary.org. To access broadcast quality video footage and still photos, go to The Newsmarket.